Well, my time has come. Somehow, even after working in this profession for a decade, I’ve not had the opportunity to foster a litter of kittens. 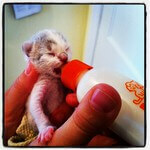 That all changed this week, when a good samaritan client brought in three kittens she had found in her neighborhood. One of our technicians quickly volunteered to hand-raise the kitties, since the mother was suspected to have passed away. The next day, our good samaritan returned with another three kittens from the same litter, bringing the total to SIX, which is too much work for any one foster parent. I eagerly volunteered my services. The sexes of these three kitties have yet to be determined (it can be difficult to discern male vs. female in neonatal kittens), so I named them Walter, Mr. White and Heisenberg after the main character on my favorite television show, Breaking Bad. I figure, even if these kittens turn out to be girls, they won’t mind being named after one of the most interesting, intelligent and complex characters on television! ———————————————————————————————————————————————————————- Exciting postscript! 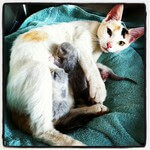 Five days after the kittens were found, their Mama Cat was also discovered by our wonderful good samaritan client. Mama was brought in to the animal hospital, and she has warmly welcomed all six kittens! Heisenberg, Walter and Mr. White latched on and began nursing almost immediately. Their three siblings, fostered by one of my coworkers, were successfully introduced to Mama a day later. What a happy ending! The family will be staying in our care until the kittens are old enough to be adopted out, approximately at 8 weeks of age. Purr! Well, it’s been seven weeks and now and Heisenberg, Mr. White and Walter are ready for adoption (plus their three littermates and Mama cat!) 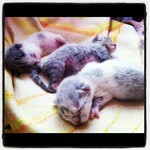 Turns out, all three of my foster kitties are females, as are 5 of the 6 kittens in the litter. 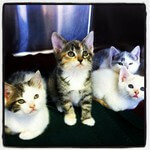 They are all healthy, purring like crazy and ready for forever homes! Please contact me via this blog or call Ardmore Animal Hospital directly if you have any interest in adopting these cuties. Ew! My Dog Ate What?